Using Evernote is key part to having a successful Mobile Office. This series is on how Evernote training can benefit your business. Lately, I have been working with more clients on how to find solutions and strategies to their technology ‘headaches’. Some of these problems can be fixed by just tweaking what they are already doing and for some clients it is learning brand new skills. Due to the amount of information on Evernote alone, I think I will share just about Evernote and Skitch in today’s post and leave Google Apps for another day. What are your top 5 things you use on a daily basis (that are either mobile apps or online tools)? I talk a lot about using Evernote in my various articles (not affiliated with Evernote in any way) because of the integration with other products. When working in the education industry as a teacher there needs to be seamless ways of transferring data from one app to another or to export the data out for assessment. Currently I only have the free account, though I might upgrade to the Premium account later this year. Taking notes (via typing, recording audio and taking images/importing images) into your Evernote account is one of the basic things that you can do within software. Often it helps to tag your notes and find them later within your account. When I am operating from my mobile office (out with clients/networking) Evernote is usually one of the first apps that I show people if they don’t know about it. As with most things, it does pay to set up a good system of file keeping and in this case it’s setting up your notebooks (folders) where you will store notes etc. Within the Evernote suite, there are these primary apps that include: Evernote, Skitch, Penultimate, Web Clipper, Hello, Food, Clearly, and Peek. I have included an image to show which apps I currently use on a regular basis. Skitch, Evernote and Evernote Hello I use on a daily basis on my iPad. Evernote Hello I just recently discovered after researching for a client wanting to incorporate Evernote into their meetings. This app has the ability to scan your business cards (you can manually enter the data) but then add the time of the meeting and location (when enabled) of where that meeting took place. 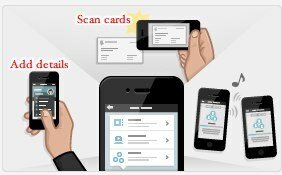 It then enters this data into your account (as an image) where you can later search for the person’s name or details. You can also add Facebook and LinkedIn details to your contacts list immediately. Skitch has been a favourite of mine and have been using it since 2009. It’s a screen capture software for both PC and Mac users. Skitch offers both a desktop app and an app for your mobile device. My most common use is to do a screenshot and then add items to the image. These often include various drawing features such as arrows, text, lines and then I can drag the file to the desktop in various formats such as .jpg, .png, .pdf, .svf, .tif, .gif and .bmp. These images are then synced to your account. The latest feature to be added is “stamps” which you can then add to images. 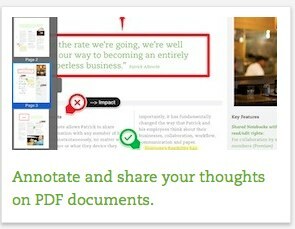 Below, is showing the annotation of a PDF using Skitch. If you go to the “Trunk” (image above) there are lots of different apps that have been developed to integrate with your account. I have started to experiment with some of these such as Jot Not Scanner Pro (just use the iPad as a scanner) and Quick Office Pro HD (manages and edits Microsoft Office Apps). These always ask for you to approve access and then these notes/files can be synced with your Evernote account. I highly recommend taking the time to look at Evernote‘s suite of apps and see how you can use it to go “paperless” in your business or workplace. Hi There, I’ve been wanting to learn more about Evernote, this post is a good reminder for me. I run a small accounting business and am about to go Google/Box for my file sharing and storing. Dropbox is also another gem.